Ethereum (ETH) has been experiencing some serious price fluctuations dropping significantly below its maximum top from a while ago, but still the network is strong and the number of miners is increasing. The same goes for mining pools with some new pools for mining Ethereum becoming available, so there is now more options available for you and the new pools are running promotions to attract more miners. 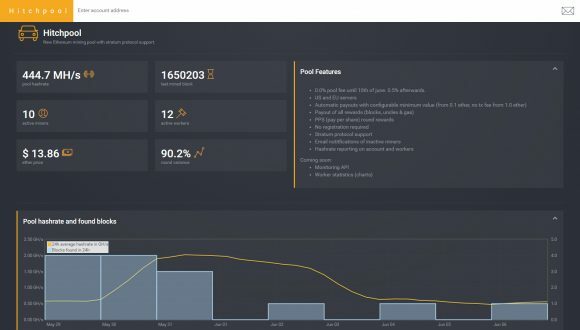 You can find some more details about two of the new pools along a list of other Ethereum mining pools that have been available for longer time. Now that the latest miner software for Ethereum is getting failover support setting a backup pool or more than one might be a good idea as well, though the big mining pools rarely have issues it cans till happen. The first pool you might wan to check out is PooLTo.Be Ethereum Pool. Still not a large number of miners and a lot of hashrate, but it supports ETH Stratum proxy as well as regular getwork mining and there is still zero pool fee for some time. The minimum payout threshold is 0.2 Ether and payouts run every 2 hours and the pool has already found a couple of blocks. 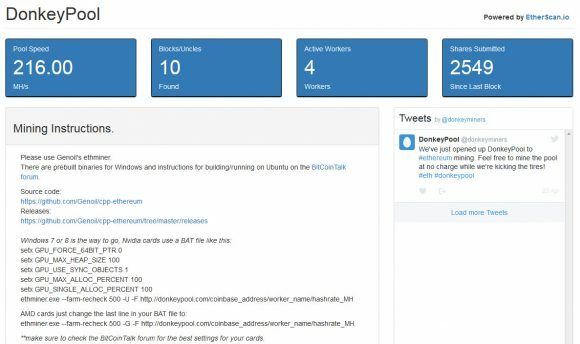 The other more recent launch in the fork of a dedicated Ethereum mining pools that you might want to check out is DonkeyPool. The pool apparently only supports getwork for the moment and it has found a few blocks already, though the number of miners and the hashrate is not that big yet. The pool will run without a mining fee until June 15th, 2016, then the fee will be 0.5%. The payouts are made once a day if a minimum 1 ETH balance is available. In the earlier days of Bitcoin mining there were also concerns about too much hashing power getting centralized in the hands of a single entity or a mining pool and it seems that we are seeing similar thing happening with Ethereum at the moment. 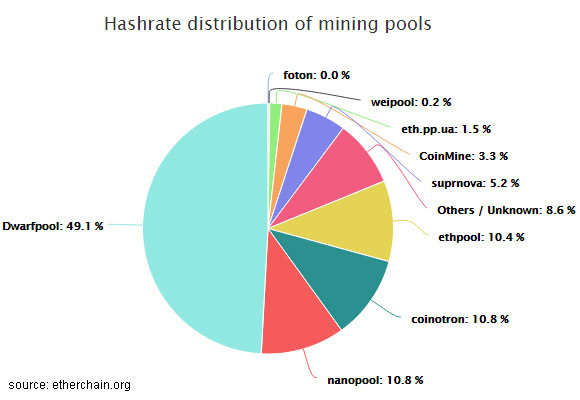 Almost half of the mining hashrate for Ethereum seems to be currently controlled by Dwarfpool, so it is advised that users switch to other pools to balance out things. New users that are just starting to get into Ethereum mining should also consider any of the other pools for mining ETH instead of Dwarfpool. Dwarfpool is also trying to encourage users to distribute hashrate more evenly with the pool fee increase from 1% to 2% to new users if the hashrate goes over 50% of the total network, though that apparently is not doing that great job. Below you can find an up to date list of Ethereum mining pools other than Dwarfpool where you can mine ETH and get a more even hashrate distribution.